We’ve reached the end of another summer here at Flywheel, which means our annual internship experience, Camp Flywheel, has come to a close! Each June, we anxiously wait for our new interns to arrive. 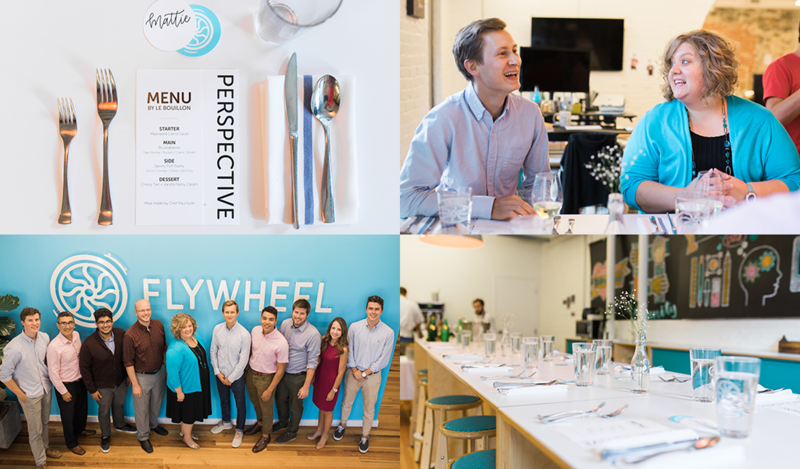 This year’s batch of interns worked across four different departments at Flywheel: marketing, operations, software development, and customer success. Let’s face it, internships sometimes get a bad rap, but we take pride in creating and delivering a well-rounded, robust, and meaningful internship program. Our interns don’t fetch coffee or make copies around here; instead they dive into projects headfirst, allowing them to make an impact starting on day one. This year’s group wasted no time creating datasets, improving processes, delighting our customers, and writing beautiful code. Honestly, it was tough to keep up with them sometimes! Our Founders’ Lunch is always a classic. Here are our three founders with this summer’s intern class! Keeping with tradition, Dusty, Rick, and Tony took the interns out to lunch in the Old Market! Our three founders’ schedules are pretty hectic, but they always find time to invest in the future of our company. These visionaries shared their stories and fielded questions our interns were dying to ask! Everything from “If your life were a movie, who would star as you?” to “What challenge is Flywheel facing that keeps you up at night?” was on the table. Not to mention more chips and guac than we could eat! Interns past and present swapping stories and enjoying ice cream! After three years of incredibly impressive summer interns, we currently have six interns who turned full-time employees here at Flywheel! This year, current and former interns walked to Ted & Wally’s (a local ice cream shoppe for you non-Nebraskans!) together and spent some time sharing their experiences at Flywheel. Summer interns asked questions about the transition to full-time, how former interns have seen Flywheel evolve and grow, and even asked for advice on how to balance work and school. Who better to mentor our interns than the people who were in their shoes (some of them less than a year ago!)? Our interns smiling after a day of volunteering at inCommon! 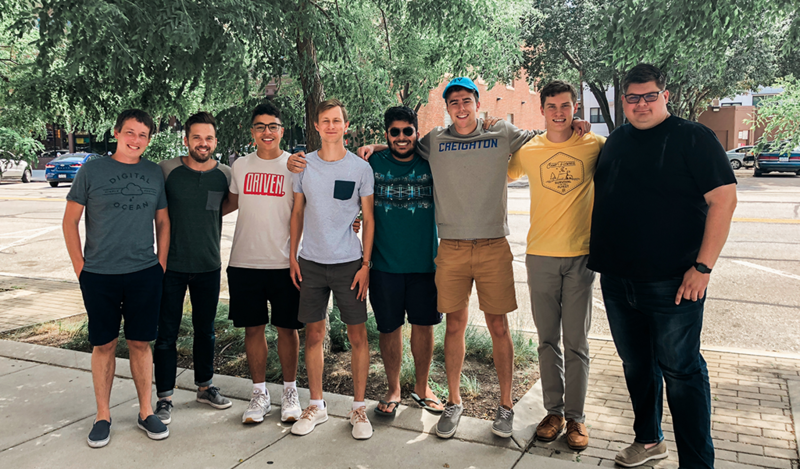 Our stellar interns not only spent time making Flywheel a better place, they also donated their time and talents to making our community a better place. 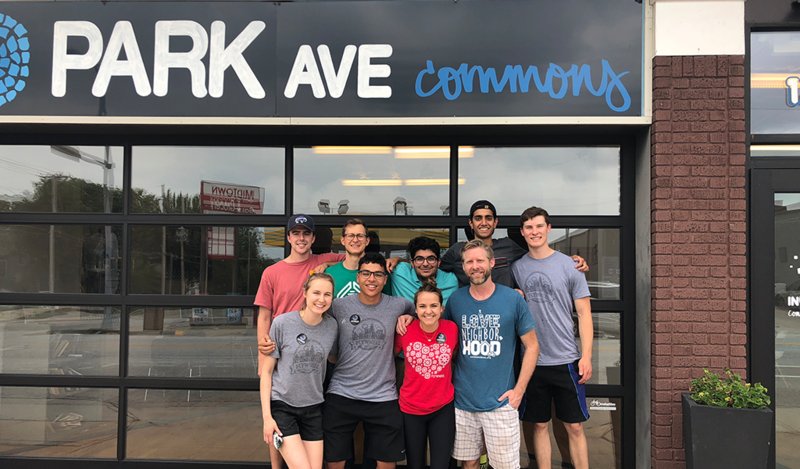 They embodied one of Flywheel’s core values, We are Productive Community Members, and spent an afternoon volunteering at inCommon, an organization committed to bringing together and strengthening neighborhoods in Omaha. Software Development interns, Neil and Grahm, put their hardware knowledge to the test and repaired the WiFi network at inCommon’s community space. Others built new furniture and helped promote the center’s upcoming fundraiser event. Our interns and their mentors enjoyed a fabulous dinner prepared right in our office! Inspired by Dwell Dinner, we coordinated a meal prepared by Paul Kulik, head chef of Le Bouillon, to celebrate the end of the summer! Each intern invited one guest who has been a mentor to them in some way. Our guests ranged from other professionals in the tech field to college professors and faculty. The dinner conversation focused on how our perspectives shift as we enter the workplace and gain experience over time. Neil, an engineering intern, presenting what he got accomplished this summer! The cherry on top at the end of the summer, you ask? Each intern gave a presentation to the whole company discussing what they worked on during the last three months and what they learned from the Camp Flywheel program! Camp Flywheel also included several enrichment sessions throughout the summer. 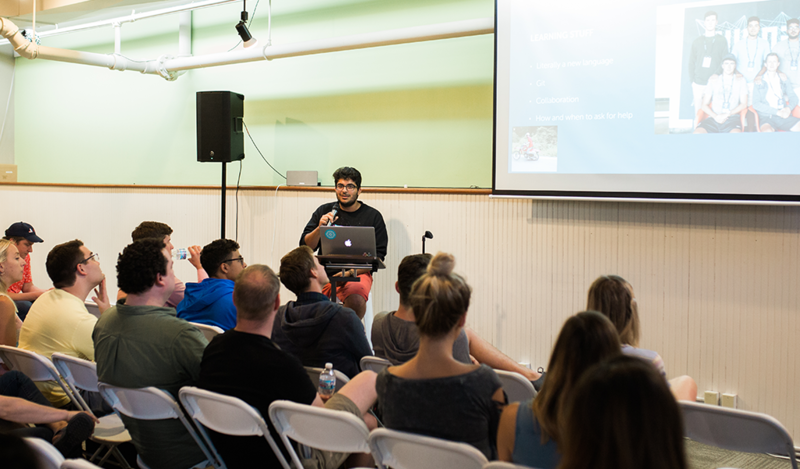 Some focused on leadership, which were taught by managers and VPs at Flywheel, and other sessions were more technical, like how to create a blog or how to help train other Flywheelers! 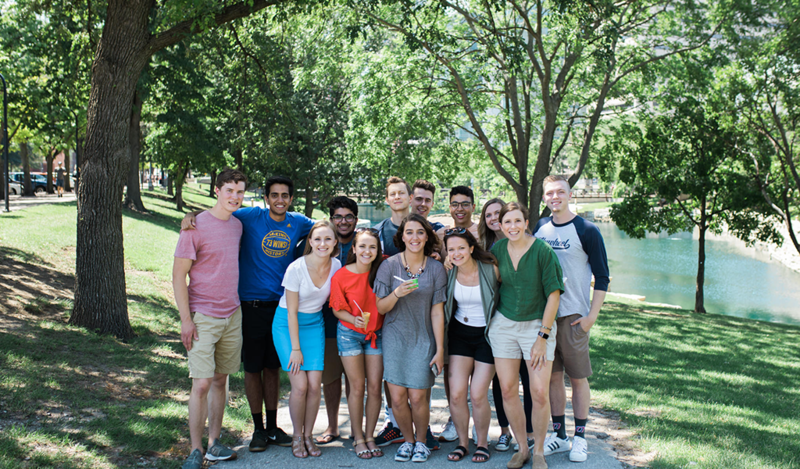 Camp Flywheel centers around encouraging the growth of our fly interns, helping them make huge impact at Flywheel, and providing them with the experience of working at the fastest-growing tech company in the state of Nebraska. Honestly, we’re counting down the days until our next group joins us for summer 2019! Interested in joining Camp Flywheel next year? Learn more here!